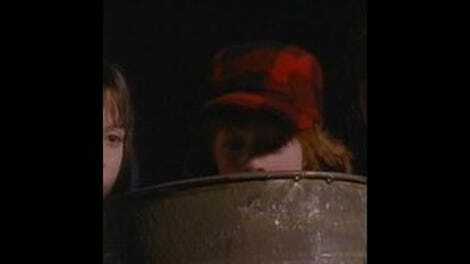 Sometimes, for me, watching an episode of The Adventures Of Pete And Pete raises more questions than it answers. This week, for instance, watching “Halloweenie,” I couldn’t help but be fascinated by just how many pumpkins they used in this episode. They were carved into character heads and smashed by the dozens in alleys. They were made into walls of a haunted house and used as major plot points. And considering this show aired in early October, when was it shot? July? Long before Halloween and probably before pumpkin farm maturity, right? Of course, Pete And Pete is not a kids show, and we all know that. This episode drives that fact home with that overwhelming sense of dread running throughout, as viewers wait for the Pumpkin Eaters—Wellsville’s personal Halloween haters—to sneak up and absolutely destroy Big Pete, à la what they did the year before to Ned Richmond, “a 15-year-old feeb… who went trick-or-treating.” No one will go near Ned anymore—not even in the yearbook. This kind of suspense without consequence is kind of tough to do, and it’s what made other Nick shows like Are You Afraid Of The Dark so permanently embedded in the fear centers of ’90s kids’ brains. To this day, people still fear indoor pools at night, doll houses, and cigar-smoking clowns because of that show. I’m remembering—correctly, I hope—that “Halloweenie” was part of a candy corn-laden theme night of programming on Nickelodeon, where each show was more, well, Halloweenie than the one before it. For its part, the Pete And Pete crew do a great job setting the dark scene in Wellsville, with one shot—a street post-Pumpkin Eaters attack, full of debris and covered with toilet-papered trees—being particularly memorable. Little Pete’s commitment to the holiday is admirable, as is his quest for the record of most houses hit in one night, of course, but what I remember most, and what stuck with me even now, watching this episode again, is that feeling of being just a bit scared, of being picked on, and of being somehow exposed. Now, I don’t think I really got teased on Halloween, but I wasn’t the coolest cat around, and maybe that’s why this message stayed with me. Puberty’s kind of a dangerous place, particularly for anyone who wants to be themselves no matter what. 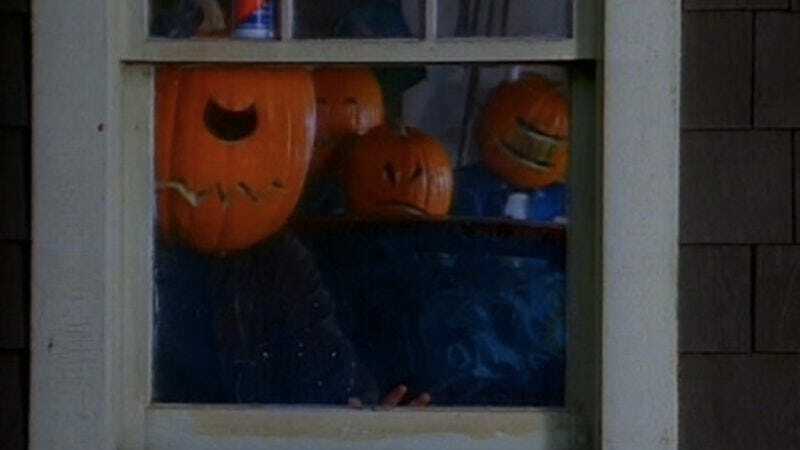 Even Little Pete, champion of all things individual, finds his livelihood and lifestyle threatened in “Halloweenie” by some bigger kids who just happened to be total assholes. Even secret Halloween hater Big Pete is threatened—not because he hates Halloween or smashes a pumpkin—but because he does what is right and assists his brother. He puts family over personal pride, and he almost ends up tied to a tree upside-down for it. It’s nice that a (presumably) kids show can write, make, and air an episode about Halloween and not have it be all about candy, parents, and more candy. I’ve said it before, but I mean it again this time: Pete And Pete is a special show because it trusts kids. It identifies the issues that they have beyond crushes and being into farts and figures out a way to talk to them rather than talk down to them. Almost 20 years later, it’s clear that this show endures because of that reason. It was weird, sure, and funny, and the ideas were imaginative, but it is sincere, and that shines through even now. At the beginning of this episode, Big Pete’s wearing a striped Free People shirt that I also happened to own. I remember being super proud of that fact, even thought it meant I owned a weird men’s shirt. Also, Pete wore the same shirt in other episodes, which I always like in TV shows. While it might speak to a show’s limited wardrobe budget, I think it just makes the characters seem more realistic. Clarissa could use pieces in her wardrobe and work them into different outfits. I could do that too, presumably. One of the benefits of Little Pete’s astronaut costume is that he can pee in it. Another question I had watching this show: Why did they switch villains (Open Face, Paper Cut, Endless Mike) from time to time? Did the kids age out? Not available? Just because?